Well, the $100 price drop less than a week ago certainly worked, as the 8GB Nexus 4 is now sold out through Google Play. 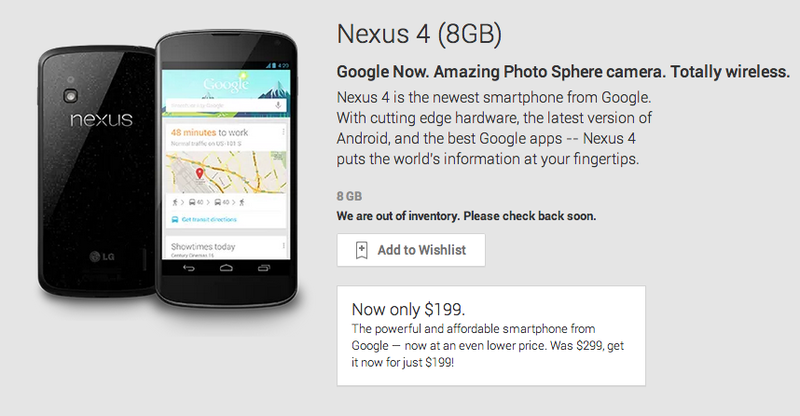 If Google was trying to push out remaining inventory before they announce a new Nexus phone, they only have the 16GB version left to worry about. At $249, I’d imagine it won’t last long either. There is still a small chance that the 8GB version returns, since the listing does say “We are out of inventory. Please check back soon.” However, that seems unlikely at this point. The next Nexus phone should arrive some time in October, possibly around October 31, according to sources of ours. At this point, we still aren’t sure who is making the new Nexus phone, but are sort of expecting a re-release of the Nexus 4 (though the manufacturer could change). We’ve seen the codename “hammerhead” tossed around behind the scenes attached to a new Nexus under the name “Nexus 4.” There also could be a Nexus 5, though we have yet to see any real proof of that other than speculation. LG’s new G2 seems like it could be a candidate for the base of a new Nexus under the “Nexus 5” name. Who picked up the $199 N4 before it sold out?